Good morning friends~ Birgit here with you today and I've got some ideas on using one die for many different occasions. 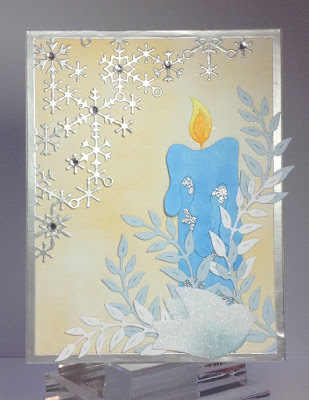 Today's focus is on using Dee's Distinctively Dies ~ Candle Set. First, let's talk about this fabulous candle! I love the options with this set as there are two different styles of drips. You can use only one or stack them for a more layered look. The same with the flame. Having the smaller flame adds even more dimension to this already awesome candle!! Lets get started with the first card. I used Dee's Distinctively Dies Wreath Builder and Impression Obsession Pumpkin Set. I used Elizabeth Craft Leaf and Berry Branches, Dee's Distinctively Dies Wreath Builder, Cheery Lynn Floral Bouquet and Elizabeth Craft Designs Pinecone. The gold sprigs are cut using Impression Obsession Small Grass. I added some red and gold stickles to the various berries on this card. I used Cheery Lynn Floral Bouquet on this spring colored card and added more colorful stickles to the berries and main flower. I used Cheery Lynn Designs Wheat Heads, Dee's Distinctively Dies Berry Sprigs, Dee's Distinctively Dies Wreath Builder and Impression Obsession Pumpkin Set. 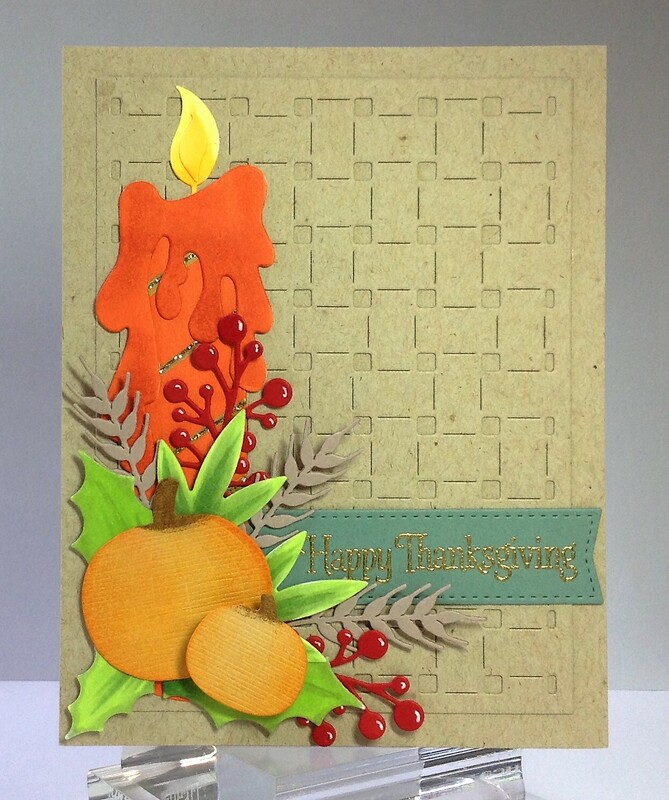 The background is cut using Frantic Stampers Basket Weave Panel. 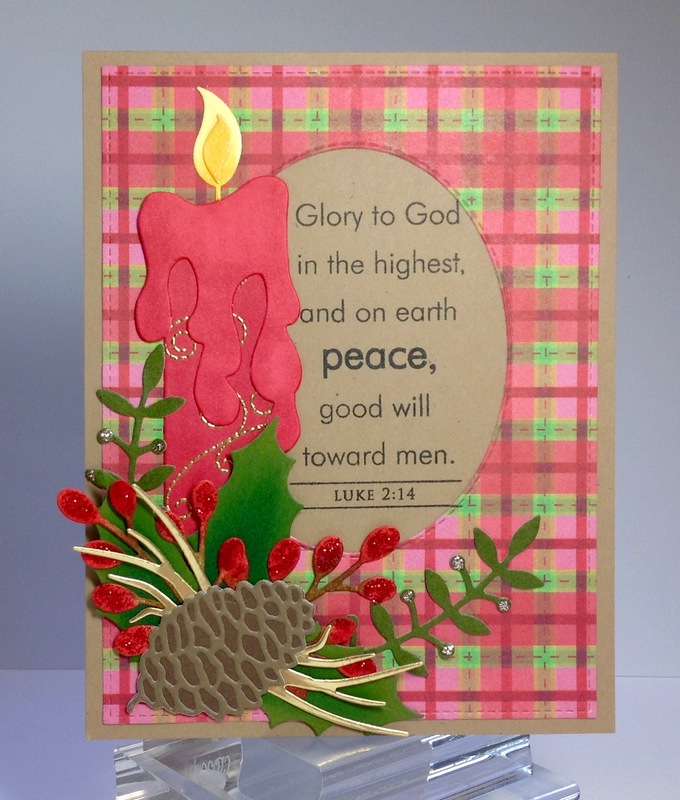 I used Poppystamps Crystal Snowflake Corner Frame and Cheery Lynn Olive Branches on this card. 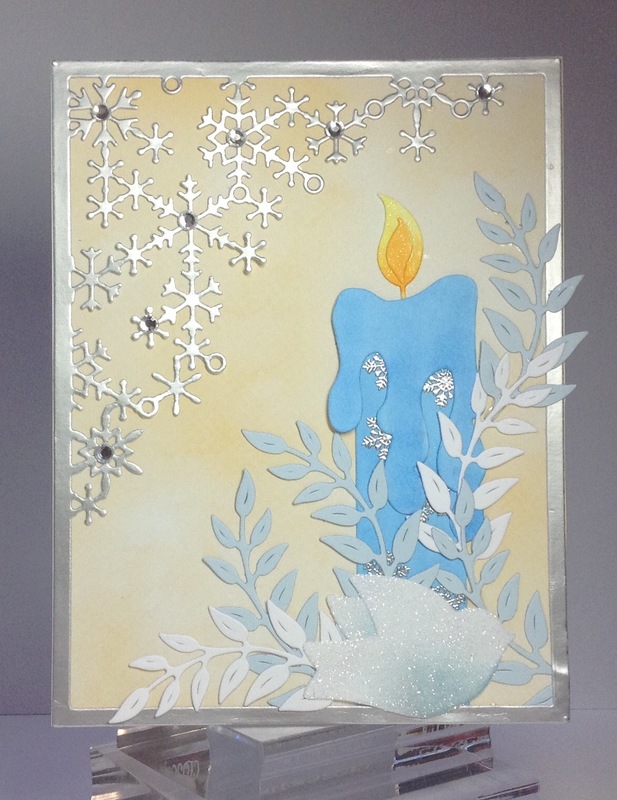 I added some gems to the centers of some snowflakes and added clear glitter to the dove. Today's Creative Tip: I cut all of the candles out of white card stock and colored them in using Copic Markers. 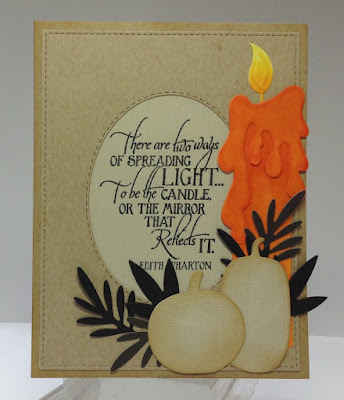 On some of the candles, I added heat embossed details according to what occasion the card was going to be used for. The Christmas candle got a gold swirl treatment, the Thanksgiving candle got some gold stripes and the snowflake candle got some pretty silver snowflakes. Look at the detail on each of the candles to see how they are "dressed up" for the occasion. I also added some Wink Of Stella to the flames on each candle to make them sparkle. Oh my gosh, Birgit, you've been a busy girl. 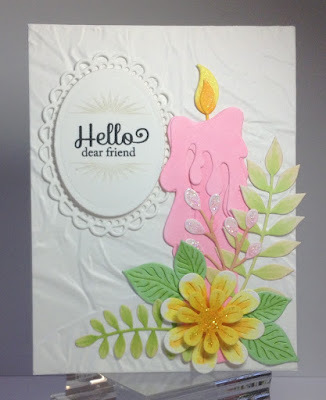 I love these cards and how you achieved different looks with the various color palettes and candle drips. Such beautiful eye candy. After seeing these cards, I want so many of the dies you used, especially that pinecone. Wonderful inspiration! WOW what a creative idea using the same die for so many occasions! Your cards are all FANTASTIC! Awesome inspiration Birgit ... thanks so much! Fantastic post and such beautiful and great ideas on how to use these dies all year long, wonderful embellishing on everyone of them!! Wow....what a great read you have given us today Birgit! How lovely to see a variety of cards for different occasions, all using the same lantern die, I love them all! YOWZA! You really know how to showcase a die! These are fabulous cards, each one prettier than the last! Love them all! Fabulous details and use of dies--all of them!